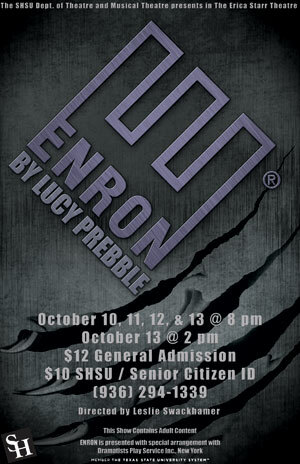 The Sam Houston State University Department of Theatre and Musical Theatre will explore one of the most infamous scandals in financial history with the regional premier of “ENRON” Wednesday through Saturday (Oct. 10-13). Show times for the play, written by British playwright and Susan Smith Blackburn Prize finalist Lucy Prebble, are at 8 each evening, with a 2 p.m. Saturday matinee, in the University Theatre Center's Erica Starr Theatre. A satirical political drama, “ENRON” transforms one of the most famous white-collar crimes in American history into a powerful story of insatiable greed and loss. An American energy company based in Houston, the Enron Corporation was the largest bankruptcy reorganization in American history at that time (2001), as well as the biggest audit failure. More than 20,000 Enron employees lost their livelihoods and retirement funds, and investors were financially devastated. The collapse of Enron sparked a wave of corporate bankruptcies, including the venerable accounting firm Arthur Anderson and the banking giant Lehman Brothers. “It’s really a tale of how we have come to the place we find ourselves in now as a nation, teetering on the edge of financial ruin,” said assistant professor of theatre Leslie Swackhamer, who will direct the SHSU rendition. “Within the context of the global economy and the power that corporations wield in our country and in our lives, I think it’s a play people shouldn’t miss,” she said. Despite the serious topics of the play, Prebble uses considerable skill depicting a financial disaster on stage while remaining highly entertaining, according to Swackhamer. “I think what’s kind of fantastic about the play is that the playwright, Lucy Prebble, has found a way to physically manifest what was happening,” she said, adding that “ENRON” won the Olivier Award for Best Play, the U.K.’s highest theatrical honor. Enron’s chief financial officer hid the company’s loses and debt in shell companies he called “Raptors.” These shadow companies actually become a physical presence on stage as dancing dinosaurs inspired by Jurassic Park. Although the collapse of Enron occurred more than 10 years ago, the themes of “ENRON” will still resonate with audiences. “People understand greed, dishonesty and corporations,” said Swackhamer. “ENRON” includes a cast of 17, who play multiple roles. The choreography is by SHSU dance faculty member Jonathan Charles; and designers include SHSU theatre faculty member Eric Marsh, who is designing the set, lights and video montages; and SHSU theatre faculty member Kristina Hanssen, who is designing the costumes. The show is presented as part of a Global Celebration of the 35th anniversary of the Susan Smith Blackburn Prize, for which more than 65 theatres in the English-speaking world are presenting plays by Blackburn Prize Finalists and Winners. The Blackburn Prize is the oldest and largest prize to honor women playwrights. Tickets are $12 for general admission and $10 for SHSU students and senior citizens. The show contains adult content and language; therefore, children under the age of 3 will not be admitted. For more information, call the University Theatre Center Box Office at 936. 294.1339.